We've sold many copies of Simon's Cat Card Game over the past year, which means a lot of people are making messes and not getting blamed! Well, while you've dodged blame, the game has garnered a lot of attention! Check out some of these previews, reviews, and overviews of our breakout hit card game! Techaeris – Crystal Black: "This is a fantastic quick and easy card game that is fun for just about any age group." PHD Games – Ian Richards: "For those that love the animated YouTube series, Simon's Cat card game is a must have." Engaged Family Gaming – Stephen Duetzmann: "For a game which can be played with pre-readers, it gets high marks from me!" The Dice Tower – Simon's Cat Review with Zee Garcia: "It's a cute little card game." Bower's Game Corner – Simon's Cat Card Game Review: "A good, light family game." 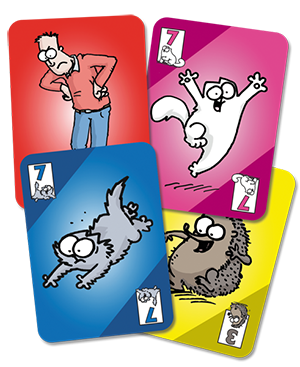 Get your paws on Simon's Cat Card Game at your local game store, or Warehouse 23, and make your own mess today!